If the timing worked out, I would be attending this retreat. I can't, unfortunately, but it's not too late for you! The early-bird discounted rates end May 31. 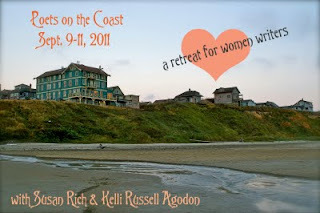 Join Kelli Russell Agodon and Susan Rich for the first Poets on the Coast Weekend Writing Retreat September 9-11, 2011, at the Sylvia Beach Hotel in Newport, Oregon, on historic Nye Beach. We will gather to write, read and share our work inspired by the landscape and creative energy around us. This retreat has been designed for women writers of all levels, from beginning poets to well published. Sessions on creativity, generating work, publication and one-on-one mentoring are included. We only have a limited number of spaces available and they will be filled on a first-come basis. With the Sylvia Beach Hotel, designed to inspire writers with its literary-themed rooms, this retreat will offer you a unique experience to explore your writing and creativity. Come spend a weekend with other women poets. Be ready to be nurtured, inspired, and creative. If I weren't 9 time zones away, I would be going too!